In the backwater village of Callowford, roustabout Errol Stone is enlisted by a church messenger arriving with urgent missives for the hermit priest in the hills. Eager for coin, Errol agrees to what he thinks will be an easy task, but soon finds himself hunted by deadly assassins. Forced to flee with the priest and a small band of travelers, Errol soon learns he's joined a quest that could change the fate of his kingdom. Protected for millennia by the heirs of the first king, the kingdom's dynasty nears its end and the selection of the new king begins--but in secret and shadow. As danger mounts, Errol must leave behind the stains and griefs of the past, learn to fight, and discover who is hunting him and his companions and how far they will go to stop the reading of the stones. I actually finished reading A CAST OF STONES last night but it took me a while to both come up with the words for this review and to pull myself all of the way out of the world in which a cast can answer so many questions. It's been a long time since a book has held hostage as tightly as this one and where I regretted reaching the end so much. When we first meet Errol, he is the village drunk who runs errands and does odd jobs just so that he can afford the next ale. He is aware of anything that happens outside of his village and the one right next door. The reader is introduced to the world as he learns just what is beyond the bend. The world building in this book is fabulous and what a great way to learn more about the kingdom and the world..
Errol himself is character that it is easy to fall for because even when he was the village drunk he has a strong core of honor even though he doesn't seem to realize it. Throughout A CAST OF STONES he learns and grows until the only thing that is recognizable is the honor. One thing I do have to say is that there is never a dull moment in his life ever since he agrees to carry missives to the hermit in the hills. Errol has a way of making friends also and there are a lot of secondary characters in the book which help the plot along. Some are there for the long term, some just for a chapter or so but there is no confusion on just who is who as they all have such distinct personalities. The dialogue is great and the pacing is spot on. 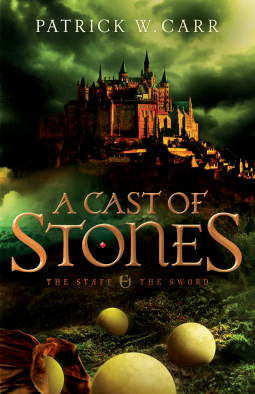 A CAST OF STONES is Mr. Carr's debut novel and what a way to burst onto the scene with a bang. I will admit to being slightly disappointed however because this means that I won't be able to pick up some of his backlist to keep me going until the next book in the series, The Hero's Lot, comes out. I highly recommend A CAST OF STONES to any reader who enjoys fantasy. I rate this book a 4.8.